Though the rain persisted, so did the smile on Move-in Day. Using umbrellas, ponchos and tarps, more than 1,400 new Wright State University students moved onto campus Thursday, Aug. 21, during Wright State University’s annual Move-in Day. The group of students constituted about 70 percent of the first-year, direct from high school students who make up the freshman class. The event began with the threat of rain clouds and by 10:30 a.m. was soaked by consistent showers. More than 100 golf carts, a fleet of luggage rollers and about 440 student, staff and faculty volunteers helped move students into 29 residence halls and on-campus apartments. 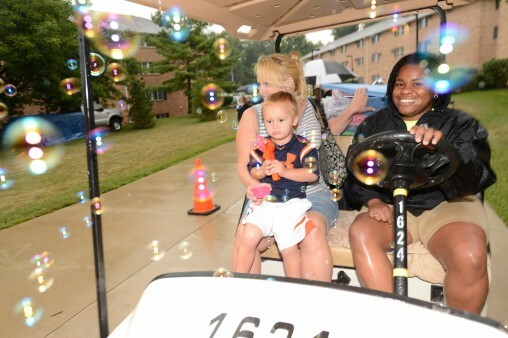 Though most got wet, the positive spirits of Move-in Day were never dampened. 110 golf carts were lined up and ready first thing in the morning. It’s always nice for families to meet Wright State University President David R. Hopkins while they wait in line. Move-in Day simply does not happen without the small army of eager volunteers. Student volunteers were eager to lend a hand to their new classmates. Umbrella + tarp = sort-of dry. Front row, from left: Gary Dickstein, assistant vice president for student affairs; Robert Sweeney, executive vice president for planning and secretary to the Board of Trustees; Dan Abrahamowicz, vice president for student affairs; Barbara Bullock, assistant vice president, Institutional Research; and Kristin Sobolik, College of Liberal Arts dean, took the ALS ice bucket challenge during Move-In Day. Wright State President David R. Hopkins (back left) and Provost S. Narayanan (back right) helped dump ice water. An important accessory for Move-in Day 2014: a tarp. Once the line moved below some tree cover the drizzle wasn’t that bad.